Pastor Willie Green was aged 50 when we first meet him. He had been the "straitlaced" pastor of the traditional Harvest Baptist Church in Capitol Heights, Maryland for 10 years. Previous to this, he had had "a good federal government job in the District of Columbia." But he knew that "the Lord had called him to preach, and he spent nearly 10 years processing grant applications to pay his monthly bills and have enough money to one day pay his way through seminary." Eventually he had got to attend Howard University School of Divinity where he had been awarded a Master's Degree in Divinity and found himself ready to go into ministry full time. He is described as a "very good-looking man. He had a slender build with a freshly manicured hairline that tapered into sideburns that were slightly grey at the temples, which gave him a distinguished look." Or that is how his new wife Vanessa, also a pastor, although a much more fiery and impulsive one, saw him. 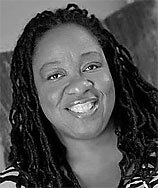 Sherryle Kiser Jackson grew up in Prince Georges County, Maryland. She trained as a teacher at Salisbury State University where she earned a degree in elementary education but was soon to find that she had a passion for writing Christian fiction. Soon and Very Soon (reviewed below) was her first novel, quickly followed by a whole series of other titles, all intended to be "soul-satisfying reads". She lives in Maryland with her husband and two children. Soon and Very Soon (the title of a gospel song) describes the problems faced by Pastor Willie Green (of Harvest Baptist Church) and his new wife Pastor Vanessa (of Mount Pleasant Baptist Church) when they try to combine their two churches. Willie struggles to maintain control of his congregation as his staunch deacon, Charley Thompson, and a group of dissenters, go to extreme lengths to try to keep the remnant of the old church going. Meanwhile, Vanessa struggles with the new balancing act of being a competent co-pastor and a nurturing first lady to her husband. !t is a realistic but affectionately described account of the conflicts that can occur when two very different black churches are persuaded by their respective pastors to get together. It is not a detective story - you have to wait for the sequel for "Brother Pastor" Willie to set about solving the mystery of how his old church came to burn to the ground, a disaster that occurs right at the end of this first book. The author writes with real understanding about the emotions and beliefs of the members (and pastors) of the two black churches and is particularly good on the potentially awkward relationship of Willie and Vanessa, who had only been married for two weeks. It is a marriage in which they can happily quote Bible verses at each other, not worrying too much about their original context, and they have a basic belief that, as Vanessa puts it in a sermon, "If you serve Him, He will reward you. He will also lead you where you need to be. He will lead you to that car, that house, that job, that man or woman. You think I would have found Brother Pastor, as perfect as he is for me, if it wasn't for God?" 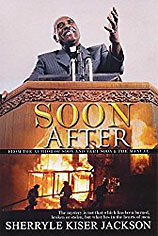 Soon After decribes how the newly unified Pleasant Harvest Baptist Church is no more than four months old when co-Pastor Willie Green is drawn into the middle of an arson investigation as he tries to discover how his old church came to be burnt to the ground. His old (and, he has recently discovered, violent) deacon Charley Thompson, who had been fiercely opposed to the merger, becomes a prime suspect. Meanwhile, Charley's nephew, Abe Townsend (a would-be pastor who runs a pawn shop and records tapes of tele-evangelists so that he can help himself to their material) tries to lead the remaining displaced members of Harvest Baptist Church to a restored independence. It Is all written in a happy, chatty, gossipy style, with nothing that would upset the publisher, the "Urban Christian His Glory Book Club," although I must admit, I rather enjoyed the way that Sister Pastor took a day off because, as her administrative assistant explained "she just wanted a Willie-free day." Obviously the Urban Christian Book Club is not too familiar with English slang. I felt that the story lacked some of the verisimilitude and appeal of the earlier book, and the plot was slow to get going. The author seems more interested in the pregnant Vanessa telling a friend that "I can't be a mother," and in the ambitions of Alexis Montgomery, a local TV reporter, than in actively pursuing the arsonist. Although Willie eventually unmasks the culprit, he never confronts him/her and we get no description of his/her arrest or admission of guilt. The author prefers to concentrate on how Willie found himself nominated as bishop and on the birth of his child, Elijah Moses Green. But, for anyone looking for a gripping detective story, there is no substitute for some exciting action. It is only in this second book in the series that Pastor Willie does any detective work.